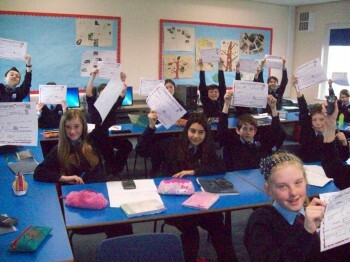 Cockermouth School recently teamed up with their local Credit Union to teach pupils how to manage their money. Allerdale Credit Union received £5,000 from the NMP Community Fund towards their ‘Money Management’ project with young people. Working in partnership with MyBnk, a charity who provides financial education to young people, Allerdale Credit Union recently delivered workshops to 200 Year 7 pupils at the school. The theme for the workshops was about how and why to save some money rather than spending it all. The 4 keywords during the sessions were income, outgoings, budgeting, saving. Pupils were able to identify up to 21 different ways to get or earn money from cradle to grave. Their ideas ranged from jobs to selling things on eBay through to finding money under the sofa and winning it. Pupils were surveyed at the start of the training and again at the end. 68% of pupils will now budget their money, compared to 12% previously. The funding also enabled Allerdale Credit Union to introduce ‘CUPPA’ – the Credit Union Personal Phone Account for under 16s. Once registered to use the credit union’s website, junior member have access to their balance on the device of their choice; including PCs, laptops, tablets and smart phones. Their account page facilitates paying in money at over 50 PayPoints throughout Cumbria, including all Post Offices and numerous shops and garages. John Bailey, Development Manager at Allerdale Credit Union said: “We now offer a school saving scheme for ‘kids with cash’ which does not require them to bring money into school. Year 7s will be invited to join the credit union (no charge) and open a ‘CUPPA’ account that can be administered from their mobile device. The CUPPA pays 1% interest on the highest level of savings achieved in the previous year. “We are also keen to explore the additional possibility of transacting payments via schools’ cash-free internet payment systems (such as ‘Squid’ or ‘ParentPay’) e.g. pupils could save with the credit union for school trips, and then transfer a payment to the school. Following the success of this pilot, further funding has been secured for the next five years to enroll all schools in Allerdale.